I’m sure everyone has seen them before – enamel or porcelain table tops from decades ago. I am obsessed. If you scrounge around in your local antique store of flea market, you may be able to find one. They come in various colors, although most that I have seen are in white. A lot of times they will be found with only the top, which I believe is a better deal. You can then use them for whatever your heart desires. 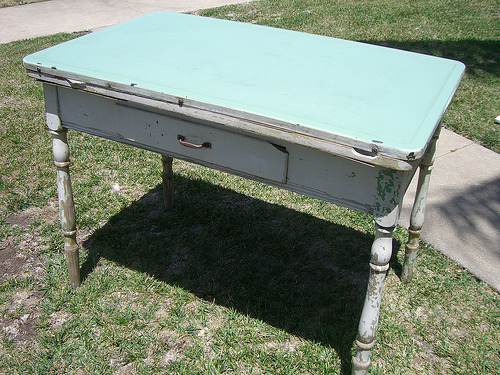 Try using an existing wood table, painting the legs and then putting the enamel piece on top to add a bit of color. Or, my personal favorite: hang them on the wall. It is an instant magnet bulletin board, which is perfect for a kitchen or mud room. I do have to give credit to my crafty, creative cousin for these ideas. Her new home has been my inspiration for a lot of my posts.